Mario Tennis Aces for Nintendo Switch is, without any doubt, one of the best deliveries of the sports saga starring the incombustible Mario and his friends. In addition to one of the best tennis games of the year, this title was destined to become one of the most outstanding of the hybrid console catalog … and has succeeded. “The Mario Tennis series raises the bar with a new game for the Nintendo Switch.” It seems a lie, but nothing more and nothing less than six months have passed since the Great N celebrated the first Nintendo Direct of the year. 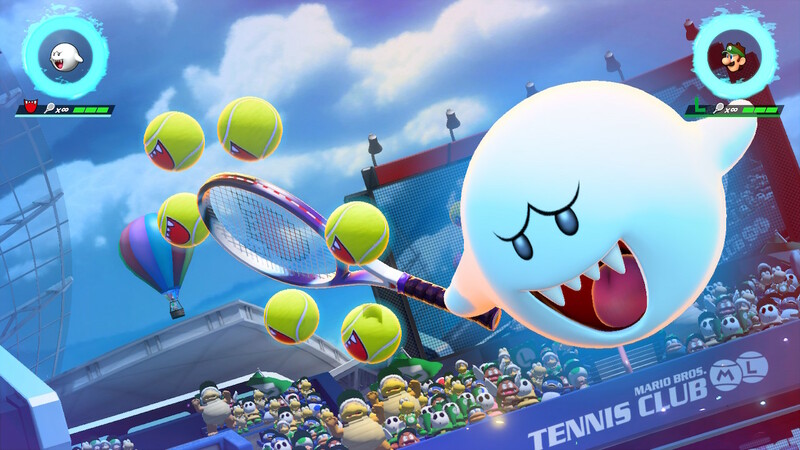 Although the presentation offered a lot of new features for both the hybrid console and 3DS , one of the most surprising was Mario Tennis Aces . 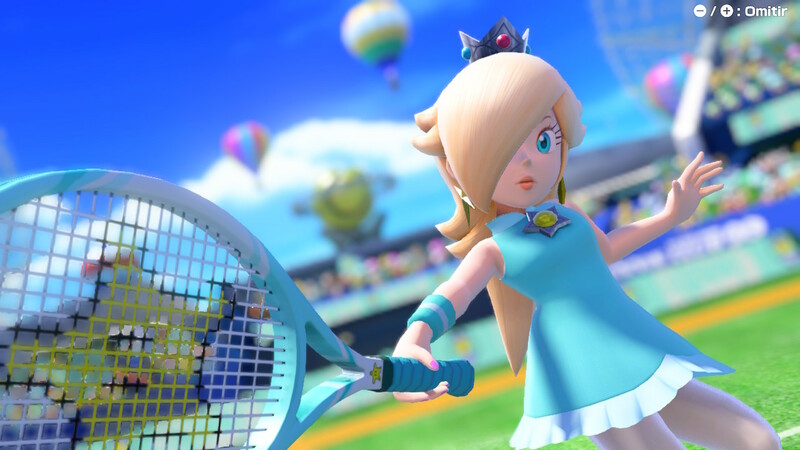 When launching at the end of 2015 Mario Tennis: Ultra Smash for Wii U , the last installment to date of this series of games, we did not expect to have a new one so soon. However, Camelot decided that the best decision he could make was to amend his biggest mistake as soon as possible: offer tickets that, unfortunately, have not been up to the tennis series. Luckily for us, the creators of such acclaimed sagas as Golden Sun and Shining have reacted at last, offering one of their greatest works. 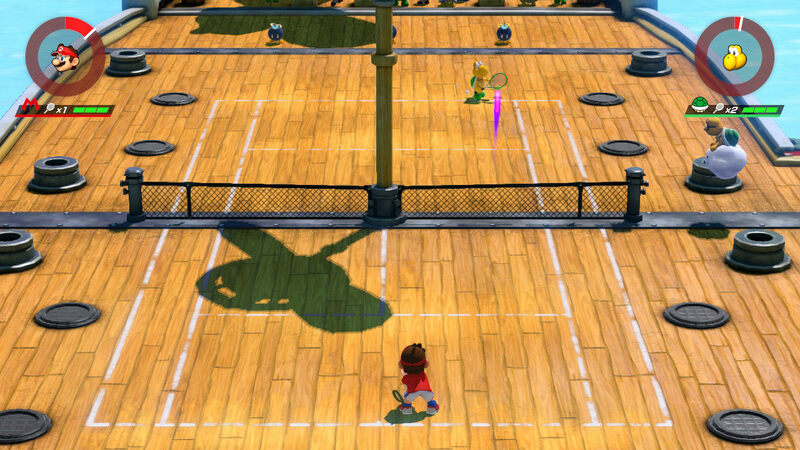 One of the main ingredients of Mario Tennis Aces is its story mode, the first time it is included from Mario Tennis: Power Tour for Game Boy Advance . The expectations about this mode were high and, the truth is, although it fulfills what we expected from it, it is easy to have the feeling that it is not very useful. But, let us start at the beginning. The story or adventure mode is the first thing we play in this installment and it takes us to some heavenly islands where our plumber plunderer and his friends are playing a tennis tournament. After being winners in a doubles match, Wario and Waluigi appear possessed by the legendary Solarius temple racket , causing the disappearance of Luigi . Given this fact, his older brother, Mario, has no alternative but to find out where he is, which leads him to enter the islands and, in passing, save them from the power of the racket, now confined to five crystals (yes, as in Avengers: Infinity War ). 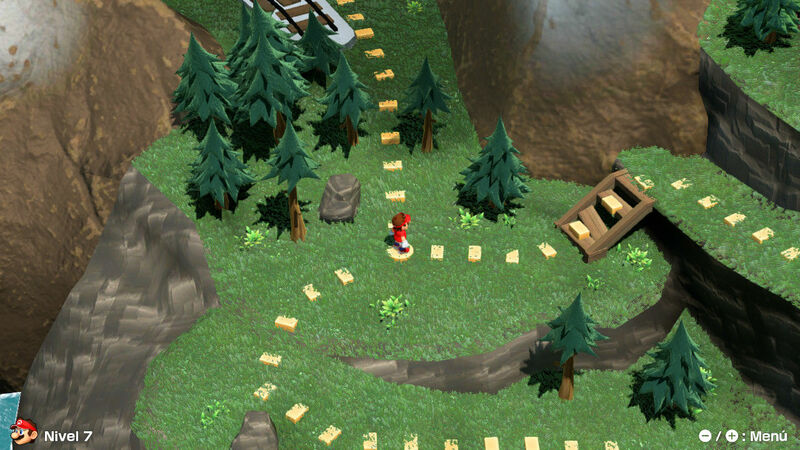 In this way, the story mode begins, full of challenges that lead us to travel through different locations connected by way of a board, in a similar way to the Super Mario Bros saga . As we advance you in our impressions of Mario Tennis Aces , the story mode of this delivery is different from that of Mario Tennis: Power Tour. The physical tests of that title have become challenges with a progressive difficulty, so this mode always puts us to the test, either in tennis matches full of obstacles and against final bosses or, for example, marksmanship tests. It should also be noted that, as we move forward, we can unlock several types of rackets, and get Mario to gain experience and level up. With this, their attributes are improved: striking power, to make more forceful shots; speed, to move faster; and acceleration, to take less time to reach the maximum speed. This is where we find one of the first drawbacks and is that the increase in statistics is automatic and we can not choose ourselves which goes up or not. In this sense, we would have liked to be able to decide, as the Mario & Luigi saga allows us, for example . Although the above is not important, it is in the final result that we find the main drawback. The story or adventure mode lasts between 3 and 5 hours, depending on the skill you have overcoming the different challenges. Although it is a more than considerable duration for a game of this type, it seems to be a tutorial to start playing Mario Tennis Aces . Beware, this has nothing wrong, even less considering how fun it is and the originality of the different tracks that we passed, but, irremediably, it leaves us wanting more. Do we play a game? 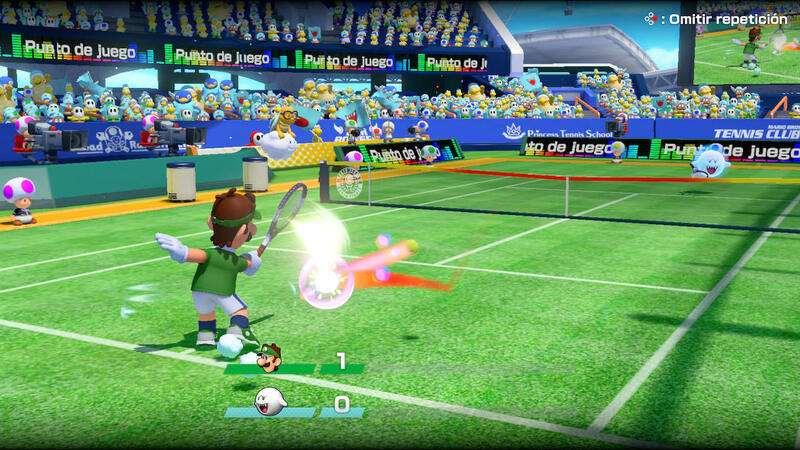 One of the main problems of the last deliveries of Mario Tennis, especially Ultra Smash for Wii U , was the small variety of modes. Well, Camelot has heard and, in Mario Tennis Aces, we have several modes that will lengthen the hours of play forever. In addition to the one we just talked about, that is, the story or Adventure mode, we can play several tournaments, three in total (a pity they are not more …), for a player. As in the previous one, between the different tournaments it is easy to appreciate that the difficulty increases considerably, so it is necessary to develop our tennis skills to the maximum if we want to win them. Another mode is Free . With him, we can play tennis duels alone or with friends both online and online. It is interesting that, to enjoy a greater number of tracks, it is necessary to unlock them in the Adventure mode. Also noteworthy is the amount of rules that can be modified to customize each game. From the normal or simple game style to the number of racquets that can be used. All in order that we can play the games as we want. But, if there is one that stands out above the others, that is the Realist . Recovering the essence of Wii and games like Wii Sports , this mode allows us to play tennis matches with three more friends using the Joy-Con as a racket. Again, we need enough space around us to not hit anything or anyone. Although it may seem bulky, it is tremendously fun and offers a much more realistic experience than we experienced with the Wiimote, thanks to the precise detection of the blows. Following the fantasy of the saga, we can enjoy games with a normal or big ball and a challenge of rally, in which the goal is to make as many hits as possible among all players. As far as commands are concerned, Mario Tennis Aces is brilliant. To the blows that so many times we have already seen, basic as topspin, cut, plane and balloon; new ones have been added within the category of special hits. The first one is directed , with which we can get a more accurate shot at a specific point on the track. Another one is the teacher , so as to gain energy quickly, reach unreachable balls. The last of this type of blows is the special , with which the vast majority of the time we can easily earn a point. As we have advanced you, to execute the special blows, it is necessary to have enough energy . The amount we have is shown in an indicator throughout the game. There are some techniques that consume more energy than others, but performing basic rallies, in addition to the teacher, recovers without major problem. It should be noted that there are two more movements, which raise the level of technique of this delivery: on the one hand, the blockade , to avoid some hits or the racket to break (it could be the defeat); and, on the other hand, the ethereal speed , which facilitates the above by passing the action in slow motion. To make matters worse, like the type of track, the character we choose affects our style of play. There is a total of 16, counting the unprecedented in the Chomp Cadenas saga , grouped according to the following characteristics: general, defense, speed, power, technique and mischief. 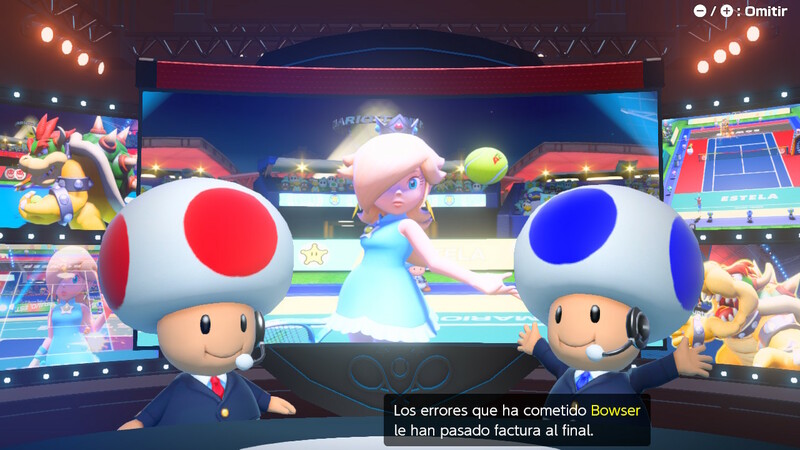 Not to mention that Nintendo has announced that soon they will arrive more like Koopa Tropa and Blooper , and that they will be able to unblock themselves ahead of time if they participate in the online tournaments that they will organize during the summer. All in all, the Mario Tennis Aces gameplay is truly profound, engaging and fun without equal. We had a lot to complain about with Mario Tennis: Ultra Smash, but if there was one thing that stood out was to be the first game of the saga in high definition. Of course, this delivery is also, which allows us to fully enjoy the outstanding animations of each character, as well as different scenarios. In addition, this title has surpassed in another aspect to the previous one: offering acclimated tracks, which is to be appreciated, since it provides a greater variety. All this will run at 1080p and 60FPS. But, we can not fail to mention the sound section that completes the great gaming experience offered by Mario Tennis Aces. Now, yes. After having played it, we can state categorically that Mario Tennis Aces is the delivery we have been waiting for so long. Although the story mode is not as satisfactory as we thought, the available modes, the number of characters and the deep gameplay offered by the different strokes and techniques, make it one of the best installments of the saga, but the best. As it is well said out there, we are facing the Mario Kart of tennis, a game that nobody should miss for nothing in the world.